This product is shipped in the raw. Slight flaking and small tears are considered normal. 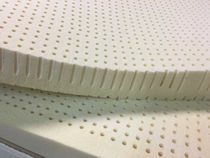 All natural talalay latex mattress topper finished size are King 76 x 80, Cal.King 72 x 84, Queen 60 x 80, Full 53 x 74, TwinXL 38 x 80 and Twin 38 x 74. All our toppers are made from the finest natural rubber components. This product is Oeko-Tex 100 Class 1 certified to be free of harmful chemicals and safe for infants. 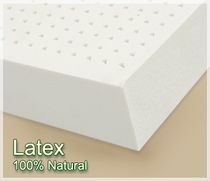 Natural latex, as its name implies, is �natural� which offers many benefits for use in sleep products. Consumers that have an organic lifestyle and have made numerous changes to remove most synthetic chemicals from their household tend to purchase all natural formulations. The elasticity, healthiness, and ability of Natural Latex to conform to your body, reducing pressure on your muscles and circulation is unsurpassed. 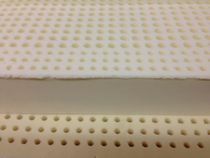 The resulting benefits and luxurious comfort simply can�t be matched by synthetic latex. However, because it is a �natural� product there are inconsistencies at the molecular level which cause Natural Latex products to wear at a faster rate than Synthetic Latex.